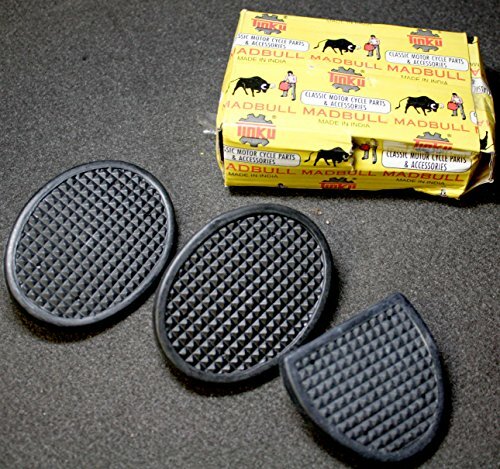 Superior Dixie Distributing Madbull Clutch & Brake Pedal Rubbers Harley Davidson 36950-41 Flathead Panhead by Superior Dixie Distributing at MC Choppers. MPN: 36950-41. Hurry! Limited time offer. Offer valid only while supplies last. Part # 36950-41Rear Brake, Clutch Pedal Rubber Brand: MadbullManufactured in: IndiaContents of kit: 2 Oval Pads, 1 Heel Pad, 3 bolts, 3 washers. Contents of kit: 2 Oval Pads, 1 Heel Pad, 3 bolts, 3 washers. Harley Davidson Shovelhead, Knucklehead, and Panhead model motorcycles manufactured starting in 1936. Each Pad has a threaded stud on the back, and includes the washer and bolt to secure them. OVAL PAD: 3 1/2" x 2 5/8" x 5/16"
HEEL PAD: 2 3/4" X 2 1/2" x 5/16"
Contains: 2 Oval Pads, 1 Heel Pad, 3 bolts, 3 washers. If you have any questions about this product by Superior Dixie Distributing, contact us by completing and submitting the form below. If you are looking for a specif part number, please include it with your message.